After Black Friday’s spending spree, we decided to do something nice for Mintos investors. Instead of spending, at Mintos we like to focus on earning and investing. And we also like zero commission fees! 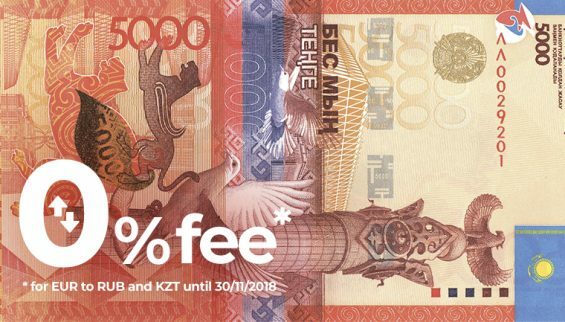 So, from November 26 to November 30 2018, investors on Mintos will have the opportunity to exchange Euros (EUR) to Kazakhstan tenge (KZT) and Russian rubles (RUB) with 0% commission fee. This is a great chance for investors to explore different markets and currencies, and to broaden their investment portfolio. RUB and KZT investments on Mintos have solid interest rates of up to 17% and all investments in these currencies come with a buyback guarantee. At the moment, investors can choose from ten loan originators offering loans listed in KZT and RUB on the Mintos marketplace. Ratings for the loan originators from Kazakhstan and Russia on the Mintos vary from C+ to B+.